Will a Solar Hot Water Timer Save Or Lose You Money? Home > Solar Hot Water > Will A Solar Hot Water Timer Save Or Lose You Money? If you have solar, is adding a simple, cheap timer to your electric hot water system worthwhile? Lately my life has been a lollapalloza of solar electric hot water heating. I’ve looked at more ways of heating water using solar electricity than you can poke a stick at. Or at least I have if your poking arm is weak and flabby and easily fatigued. Recently I went into the details of using a relay with a Fronius inverter so it will turn on a hot water system when there is enough surplus solar electricity to power it. I also gave a run down on solar hot water diverters in general, which are devices that will take even small amounts of surplus solar power and send it to a hot water system in a form they can use. And I delved into the secrets of the Sun Flux hot water controller that uses it own dedicated solar panels to provide power for heating water. Soon I will put several brands of diverters into a little Thunderdome and make them fight to see which one will come out on top. But for now I am going to describe the simplest and cheapest way to heat water using solar electricity, which is to use a timer so it switches on during the day, hopefully when there is enough surplus solar electricity to run it. A timer may only set you back around $100 if you have it installed at the same time as your solar or hot water system. But if you need to get someone to come around just to install the timer it is likely to cost $200 or more. And you can always pay extra for something fancy, such as a timer you can easily adjust yourself. A hot water system timer is a great way to save money provided it doesn’t end up costing you money. The drawback of a timer is it’s almost impossible to avoid using grid electricity at least some of the time. You will pay for that electricity at your standard rate and not at a lower controlled-load or economy-tariff rate. Having a small heating element in your electric hot water system. Having a large solar system. Being out of the house during the day. Living in a location with decent winter solar output. Having a relatively low feed-in tariff. If enough of these duckies line up in the right way, then you may be able to save money instead of losing it by installing a hot water timer. Why Not Use Solar Thermal Hot Water? Well, it’s not that anything wrong with solar thermal hot water, it’s just there is something right with solar PV, and that is, the price is right. Solar thermal is a mature technology that hasn’t come down much in cost over the past few years, while solar electricity has. As a result, many people have concluded PV is more cost-effective for heating water than solar thermal. Solar thermal works during blackouts. You can add a solar thermal hot water system even if your Distributed Network Service Provider (DNSP) won’t allow you to install any more solar PV. In a world full of smart technology and intelligent systems, a simple timer that turns on a hot water system for a set period each day is pretty bloody dumb. All it can do is turn on the hot water system at a time when you hope there will be enough surplus solar electricity to run it and then turn it off later. It can’t decide to wait for the sun to come out from behind clouds and it can’t respond to household demand and shut itself off if someone turns on a hairdryer or otherwise increases electricity use. Solar hot water diverters are not geniuses, but they are very good at slurping up almost all the surplus electricity a solar system produces and sending it to an electric hot water system in a form it can use, so the result is pretty clever. Sure, it is possible during periods of cloudy weather and high hot water use that solar electricity alone isn’t enough and grid power is needed. But a diverter is the most effective way to make sure surplus solar electricity goes towards heating water. A Fronius relay plus datamanager is a very smart system and capable of turning on a hot water system only when there is enough surplus solar electricity to run it and it can turn itself off if the sun goes behind clouds or household electricity use rises. It can’t do the diverter’s trick of getting a heating element to use less power than it is designed for. This means that, all else equal, more grid electricity will be required to heat water than with a diverter, but it is still quite clever. Even if you use a Fronius inverter that doesn’t have a data manager2, which is the part that is a clever clogs, and use a dumb relay by itself, because it will only turn on when the inverter is producing a set amount of electricity, it still ends up being smarter than just a timer. So if you have a timer connected to your hot water system, every time it turns on, you are taking a gamble there will be enough surplus solar electricity and your hot water system won’t start consuming expensive grid power. The larger the element the more quickly it will heat water, but the more power it will draw. If there isn’t enough surplus solar electricity being produced when the timer turns it on, whatever is lacking will be drawn from the grid, so the smaller the element, the better when using a timer. A 1.8 kilowatt element can heat 250 liters of water from 20 degrees to 60 degrees in 6.5 hours, which is plenty of heating power for a typical household of two or three people, but for a household that is a large user of hot water this may not be enough. The larger your solar system, the more likely it is to produce enough surplus solar electricity during the day to run the hot water system without using grid power. And you will need a big solar system to be sure of having enough surplus electricity to power even a 1.8 or 2.4 kilowatt heating element. Unfortunately, for a variety of reasons, rooftop solar rarely produces as much power as the total capacity of its solar panels. So if you have a north facing solar system with 5 kilowatts of panels, it may not produce more than 4 kilowatts of power even at noon on a clear day. From mid-morning to mid-afternoon on a cloudless day, such a system might produce from 2 to 4 kilowatts. Assuming household electricity consumption at that time is minimal, this is only enough to power a 1.8 kilowatt element without using grid electricity. The situation is improved with a 6.5 kilowatt system, which is around the maximum size that is practical for many households to install. This could be expected to produce from around 2.6 to 5.2 kilowatts from mid-morning to mid-afternoon — enough for a 2.4 kilowatt element, provided there is no one at home using power. Unless a home’s rooftop solar system is at the edge of being unfeasibly large, it is impossible to avoid a hot water system on a timer using grid power if it switches on during cloudy weather. While light cloud may cut solar output by 75% or less, very dark cloud can cut it by 90% or more. If overcast conditions cut output by 80%, then a 5 kilowatt system may only produce from 0.4 to 0.8 kilowatts from mid-morning to mid-afternoon. That’s only enough to supply around one-third the power consumption of a 1.8 kilowatt element, provided the home has no other electricity consumption at that time at all. If you are not at home during the day then you are not going to be consuming electricity and reducing or eliminating the amount of surplus solar electricity available when your hot water timer switches on. So if no one is at home during weekdays that is good, and if you are also usually out during the day on weekends too, that’s even better. 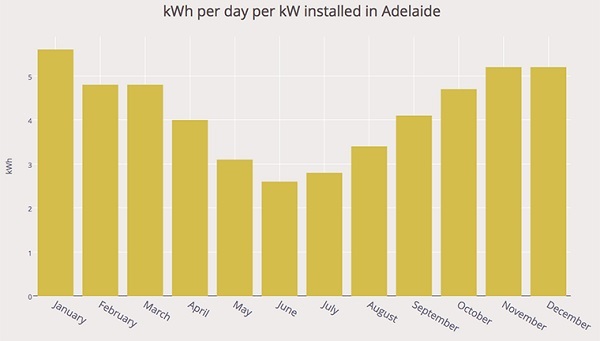 In Melbourne the average for June is almost as high as in Adelaide, but Hobart averages under 2 kilowatt-hours a day per kilowatt of solar panels. 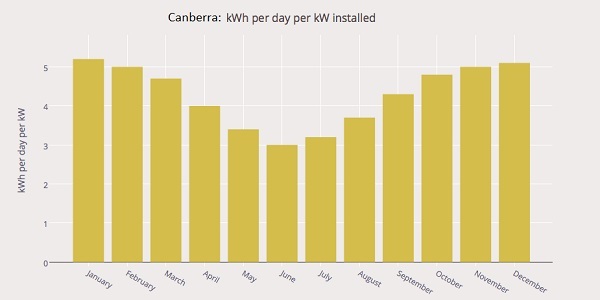 Unfortunately, though not unexpectedly, Australian capitals that have the coldest winters and the highest hot water use, have the worst winter solar production. Most people with an electric hot water system have it on a controlled load or economy tariff. This allows people to pay less for grid electricity used by their hot water systems, but the power is only available for a limited amount of time each day3. Hot water systems on a controlled load tariff are not permitted to receive grid electricity from another source. As a result, most hot water systems cannot be put on a timer to receive solar electricity during the day and be on a controlled load tariff. An exception to this is double element heaters, which can have one element on a timer and the other on a controlled load tariff. The element on the controlled load can be set to a lower temperature so most of the heating gets done during the day. Setting a hot water system timer involves striking a balance between minimizing grid electricity use and not running out of hot water. If your hot water system is on a controlled load tariff and you occasionally run out of hot water, then unless you found these events to be exciting opportunities to have invigorating cold showers, then you will probably want to set your timer so your hot water system will run long enough to heat a full tank of water. For a 315 liter tank increase the times by 25% and for a 400 liter tank increase the times by 60%. So if you have a 250 liter hot water tank with a 1.8 kilowatt element, you may want to set the timer so it will run for over 7 hours a day. On most days the hot water system will reach its maximum temperature and switch off well before the 7 hours are up, but on days of high hot water use it may run for the full 7 or more hours. If the timer was set to switch on at 10:00 am then it should usually reach its maximum temperature by 2:00 pm, but if that is not long enough it will be able to keep heating until past 5:00 pm. The longer a hot water system is left on, the more likely it is to use some grid electricity to maintain its temperature later in the afternoon. But that’s a price most people are willing to pay to not have a cold shower. If you have spent the money to get a timer you can easily adjust yourself, then changing the settings if you need to is not a problem. But if the timer has to be set by an electrician you’ll want to get it right the first time. As you can probably guess, it is pretty difficult to wring savings out of a hot water timer. I thought about making a 3 dimensional, rotating graph, that would show all the possible permutations of hot water timer phase space and allow people to see exactly under what conditions they could save money. I thought about it, but I never had any intention of making it. Instead, I’ll give a variety of examples and use them to estimate the possible savings that may result from using a timer. I freely admit that in creating the estimates I used some intelligent guesswork. But don’t worry, if you don’t like that, I’m more than happy to give you unintelligent guess-work. All the figures for electricity prices and feed-in tariffs are based on actual figures at the locations. An average of 4 kilowatt-hours a day is used heating water. No one is home on weekdays. The hot water system heating element is 1.8 kilowatts. Solar output is high enough so 70% of electricity consumed by the hot water system would be solar if put on a timer. Grid electricity costs 27 cents a kilowatt-hour. A controlled load tariff of 17 cents a kilowatt-hour. Then under these conditions a hot water timer would save $18 a year. If the portion of solar electricity used to heat water fell to 62% or less getting a timer would lose the household money. A controlled load tariff of 9 cents a kilowatt-hour. Would only lose money, as the feed-in tariff is higher than the cost of the controlled load tariff. It would make more economic sense to send leave the hot water system on the controlled load tariff and send surplus solar electricity into the grid. An average of 5 kilowatt-hours a day is used heating water. Solar output is high enough so 68% of electricity consumed by the hot water system would be solar if put on a timer. Grid electricity costs 29 cents a kilowatt-hour. A controlled load tariff of 18 cents a kilowatt-hour. Then the household would save $23 a year. Solar output is high enough so 66% of electricity consumed by the hot water system would be solar if put on a timer. Grid electricity costs 32 cents a kilowatt-hour. A controlled load tariff of 24 cents a kilowatt-hour. Under these conditions the putting the hot water system on a timer would save $107 a year. Solar output is high enough so 72% of electricity consumed by the hot water system would be solar if put on a timer. The solar feed-in tariff is 7 cents a kilowatt-hour. Under these circumstances installing a timer would save $210 a year. Due to poor solar output and the existence of controlled load tariffs, a hot water timer is very unlikely to save money in either Melbourne or Hobart. 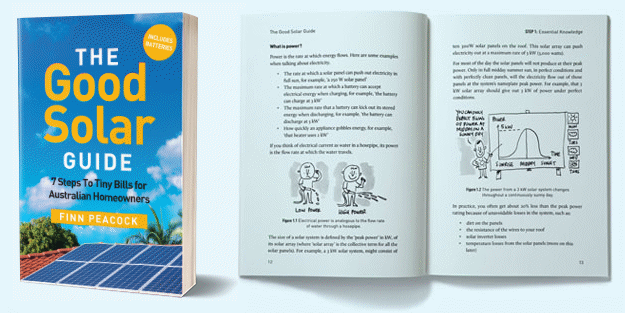 In Darwin the feed-in tariff is equal to the cost of grid electricity so a timer can’t save money. While it seems possible for a hot water timer to save money in a some locations under favorable circumstances — such as having a small hot water element and not being home on weekdays — it seems likely that putting hot water systems on a timer will lose the majority of Australian households money. The exception is Perth. Unlike most of Australia, controlled load tariffs are not available in Western Australia. This means there is no danger of losing money by putting a hot water system on a timer. I would say it is worthwhile for anyone in Perth who is getting rooftop solar installed to have their electric hot water system put on a timer at the same time. But very few people have electric hot water systems in Perth, as most homes there use natural gas hot water. You forgot to mention that environmentally it would be better to send the excess electricity to the grid due to the thermal losses associated with hot water storage. That is definitely true. It would also build character and help keep people’s thoughts pure. What about evacuated tube systems? I was under the impression they were the most efficient for heating water. Thanks. I was worried because we have just invested in a sunpower 6.23 system fronious inverter 5kw and an apricus evacuated tube system. Does this sound like a good combo? That sounds like a great way to slash your electricity bills and reduce greenhouse gas emissions. With the 10 year warranty on both the Fronius inverter and Apricus solar thermal hot water system, I expect they’ll give you many years of problem free operation. You mention that “a hot water timer is very unlikely to save money in either Melbourne or Hobart”. I’m in Hobart and I’m about to get solar installed. I’ve ordered a timer to be put on my hot water, and I’m going to change to a ToU tariff. In Tasmania peak times are between 7am-10am and 4pm-9pm AEST weekdays. Off peak (other times and all weekend) pricing is actually cheaper by 2 cents than the conventional “HydroHeat” tariff. The hot water cylinder is 160L and a 2.4kW element, so using your calculations that is 3.52 hours to heat the water from 15 degrees. 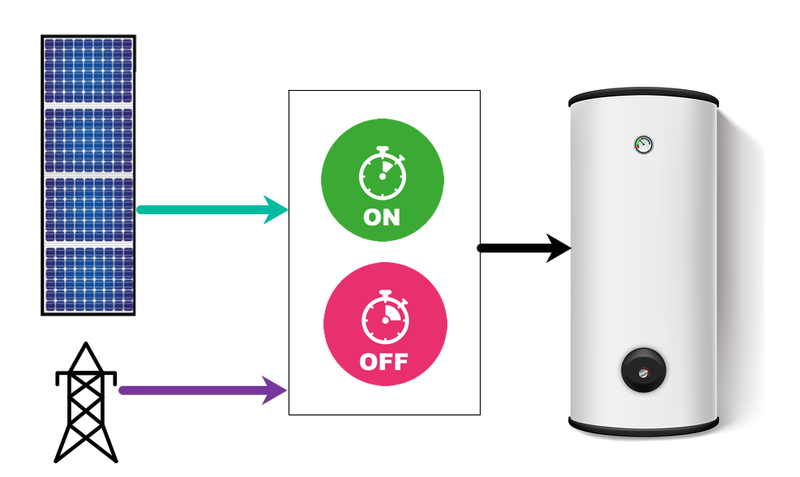 Because nobody is at home during the week, we plan on setting the hot water timer to run daily from 11am-4pm with the hope of maximizing the solar to divert excess to it, our standby consumption is relatively low (300W). We’ll also put in the timer to switch on daily between the hours of 3am-7am (offpeak time) in case the thermostat has dropped overnight for morning showers and use. In winter we can just bump the thermostat up which may result in the water staying warmer for longer, but also potentially taking longer to heat (more grid power). Having just upgraded our system to well exceed our demand (4x) I can say with confidence the key to avoiding any of these decisions is correct system sizing from the outset. If you size for %100 demand offset on the shortest darkest winter day, the rest of the year will be taken care of, i.e. 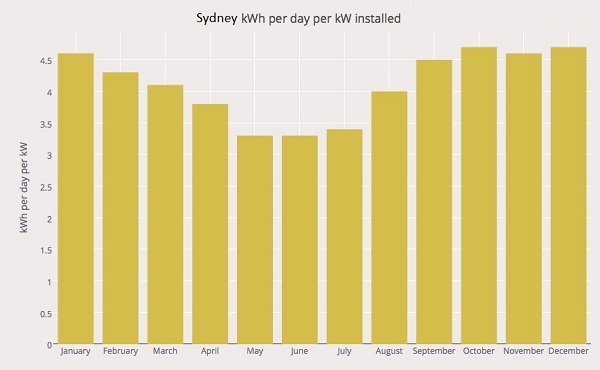 if a 5KW would meet your yearly average, install 10KW. Prices have never been cheaper and no-one really knows how long the rebates will be available for. My two cents worth…. I have read reports that the extreme right wing senator, who does not believe in solar power having any advantage,has had installed on his own house, a 12kW capacity domestic rooftop photovoltaic system (although, being a member of the federal parliament, and thence, immune from any laws in Australia, he is probably allowed to get away with doing that). When we got our domestic rooftop photovoltaic systems installed (we have two, due to the nature of our roof), a couple of years ago, we were prohibited by the state regulatory body (which comprises of the coal fuelled electricity companies) that controlled authorisations for getting rooftop photovoltaic systems installed in WA, from getting any more than 5kW of generating capacity, installed, as any more than 5kW would significantly disrupt the already unstable electricity grid. And, in WA, by the same reasoning and regulatory authority, in having a 5kW generating capacity, domestic rooftop photovoltaic system, we are apparently banned from having any associated electricity storage batteries. Can you please publish a comparative table that states the maximum allowable generating capacity per household, and, associated storage batteries, for domestic rooftop photovoltaic systems. for each state/metropolitan area? After looking at all the options for heating my HWS that you have listed in your article I believe I have installed the perfect combination. To install any kind of separate timer, diverter etc it will be very difficult to achieve any kind of acceptable ROI. So now I have my Powerwall 2 installed and up and running I have had fitted a $18 digital fully programmable seven day timer bought on eBay from China ( very nice little unit). My 3kw inverter coupled with the 5kw of available power from the PW 2 inverter and my timer set for two hours on from 11.30 to 13.30 hrs heats my 315lt tank with single 3.6kw element (takes just over an hour most days so far) has maintained my water temp at around 60c for the last couple of weeks with zero grid power being drawn. I was getting the Battery for grid independence anyway and being able to run the HWS for an extra investment of $18 is the icing on the cake. I previously had an instantaneous gas hot water system which required delivered gas bottles. Three years ago our cost was $140 bottle hire fee per year + 5 bottles / year at $145 a bottle. Total Gas cost per year $865. Electricity was $500-$600 per quarter so let’s say $2k/year. I decided on a Solaredge 5kw inverter + optimisers with Qcells 6.5KW panels + largest Sanden heat pump hot water which only runs between 7am and 5pm. I have not run out of hot water yet with 2 adults and 2 kids. I have some panels east facing, some north and some west to maximise the generation at the start and end of the day. In summer on a cloudless day I can generate in excess of 40kwh. In winter I don’t do as well as strictly north facing panels but I use more energy in summer due to aircon so it suits me fine. This is in Brisbane. My total energy cost is around $700 to $800 per year now. I am saving $2k / year which gives me around a 5 year payback for the panels and heat pump. The saving is probably more now because we installed 3 years ago. Is it legal to have your HWS connected to both the general tariff and an economy tariff, but only one at a time and have a changeover switch to pick the tariff you wish use? So if you know its going to be an overcast day you can switch it to the economy tariff? As far as I am aware, it is not permitted to have an appliance that is on a economy tariff (or controlled load) connected to the grid in any other way. Not only do the grid operators want devices on economy tariffs to use electricity when demand for grid electricity is low, they also want it to be impossible for those devices to use grid electricity when demand is high. I’ve been told it is allowed in Tasmania. It is explicitly prohibited in QLD. My interpretation of the rules in other states/territories is that they do not allow it either. Feeding raw solar power to a HWS element is dreadfully inefficient, and as the article describes, is only feasible if ” there is no one at home using power.” I.e. it wipes out the total output of any permissible grid connected PV array. + Buy a heat pump with a Grundfoss or equivalent quality compressor, and there seems no reason why it shouldn’t be as durable as a good air conditioner. it is no longer necessary to camp out at the in-laws whenever you need to heat water. Just 1 kW creamed off the top of peak array output from 10 a.m. to 2 p.m. is hardly noticeable on an adequate PV array, and 16 kWh would boil most HWS. Thanks Ronald, this effectively answers the question I posed on another thread… in short a timer does pay in Perth due to the absence of any cheaper controlled load / HWS tariff. Living in Cairns we have a 3 bedroom house and a separate Bungalow with bathroom,living and it’s own kitchen. We placed the 2 X 250 litre HWS we already owned side by side. The first tank has a 1.8 wattage element pre heating the water on timer, this then feeds the second tank on Tariff 31 which then supplies both buildings. Not sure of the savings but have more than enough hot water. Best hotwater system is a roll of cheap polypipe sealed in a box lined with silverfoil with a glass top ~ all run through an 2nd-hand insulated hot-water tank in the laundry. I’ve seen such a unit bring water up to nearly boiling even on a winter’s day in Victoria. All you need is mains pressure or a 12-foot head from a tank and a safety-valve. Takes a day to put together and casts a coupla hundred dollars…..Too easy. Can anyone tell me where this specific guideline comes from? “growth of dangerous microorganisms such as Legionella. To keep them under control, a hot water system should reach a minimum of 60 degrees at least once every three days.